In my career as an artist, my goal is to approach perfection and sincerity, using my cutting knife to enrich my life. Yu Chengyou joined a training class run by printmakers of the Great Northern Wilderness School in the early 1980s. He also studied at Jixi Normal School and worked in Jixi Mass Arts Centre in Heilongjiang province from 1987 to 2002. He is a professional printmaker in the Heilongjiang Provincial Printmaking Institute. 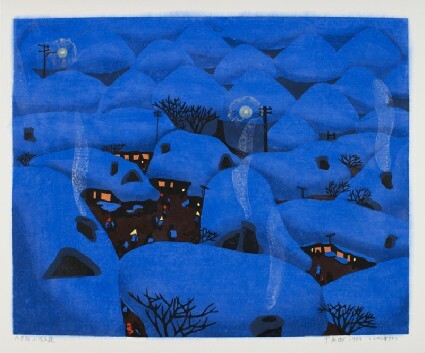 He works in both water-soluble colour and oil-based ink woodblock printmaking, with a wide range of subject matter that includes birds and flowers, figures, animals, and especially the natural scenery of north-east China. His recent woodcuts often use traditional objects and calligraphy, and are usually neatly and finely cut and printed with multi-blocks.